"There's Going to be a Heartache Tonight"
A recognized master of Kiowa "ledger" art, Sherman Chaddlesone often gleans subject matter from tribal historic records maintained by early-day Kiowa calendar artists. In Chaddlesone's interpretation of specific events, he diligently utilizes all the elements of style of the earlier Kiowa artists. "The event here recorded occured at or immediately after the Sun Dance in the summer of 1843, but is indicated above the winter mark as a matter of convenience. The figure represents a woman wounded in the breast. After the women have cut down the trees for the medicine lodge, they drag them to the place where the lodge is to be erected, escorted by a body of warriors in front and on each side. A warrior frequently invites a woman to get up and ride behind him, and the invitation is generally accepted. Although this is customary, it sometimes gives rise to jealous feelings on the part of husbands or lovers. On this occasion, at the invitation of Chief Dohasan, a woman got upon his horse behind him, which so enraged her husband that he stabbed her. The woman recovered, and the husband received no other punishment than a rebuke from Dohasan, as he (Dohasan) was a great chief and an old man -- too old to be running after girls. Immediately after the dance, a war party under Giadedeete (Faces-the-Line), went against the Mexicans of Tamaulipas. They killed a number of people and destroyed houses, but on recrossing the Rio Grande encountered a body of Mexican troops when Giadedeete and two others were killed." 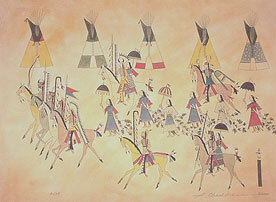 The pictographic image in the lower right corner of Chaddlesone's work is the same as that which Little-Bear entered in his calendar as a record of these events. This site and all contents are copyright 2000-2001 by the artist. Images are watermarked using Digimark technology.